Inspired by one of the greatest mid-century designers, Alfred Shaheen, The Malalani Dress by Powderpuff Boutique is a beauty to withhold! This dress has been on my wishlist for FOREVER and one of the first pieces that caught my eye when I first discovered the Powderpuff Boutique website. When Paula-Jane (the mastermind and chief lady behind Powderpuff) offered to send one over for this shoot at the newly restored St James Theatre with Elizabeth J Photography, I was thrilled- it’s the perfect fit for such a elegant location. The Malalani Dress screams golden glamour and is made out of a luxurious gold shantung fabric. This fabric has a ever so slight stiffness to it which helps to keep the skirt looking full. The bust features the iconic petal bust detailing with contrasting black shantung inside- wear it up or down depending on your mood! With the black contrast in the bust and of course my dark hair, I decided to just go with my trusty black patent heels and this black and gold necklace I bought 2 years ago at a shop in Santa Monica. The Malalani Dress comes with a matching grommet belt but you could also mix it up with a skinny black belt to tie in more contrast if you so desire. I love that the Malalani has adjustable straps and a side pocket- features I always appreciate in a dress! I did find that it’s a little shorter in the waist than what I am used to although once I put the belt on that seemed to help and it didn’t bother me anymore. The skirt of the Malalani Dress is gathered to the waistband and has medium fullness. I couldn’t get one of my usual full petticoats underneath so if you want to be able to wear something underneath, it would have to be a single layer petticoat or perhaps the Canvas Underskirt from Pinup Girl Clothing. 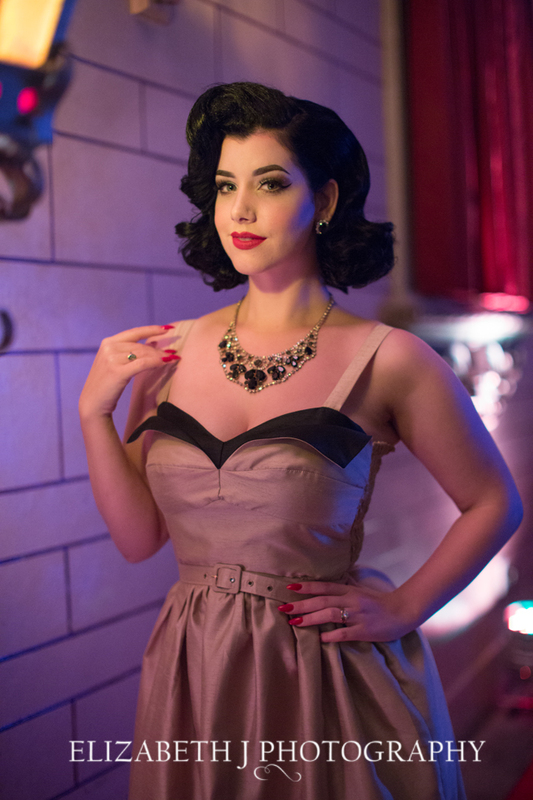 The Malalani Dress is destined for a night out out the theatre and a martini! Available for order from the Powderpuff Boutique website for AU$175 with a flat shipping rate of $15 within Australia or $25 International. Thank you as always to the wonderful Elizabeth J Photography for the gorgeous set of photos. We were so lucky to get to shoot in the St James Theatre and Elizabeth handled the difficult lighting like the talented pro she is! Disclaimer: Whilst The Malalani Dress was gifted to me, I never accept anything that I do not truly love and all opinions expressed are honest and my own. Classic! Love it on you! A gorgeous dress and another beautiful shoot at the lovely St James. I do think that this is not the best colour for you though. Oh my, this is beautiful! Love the subtle shimmer!